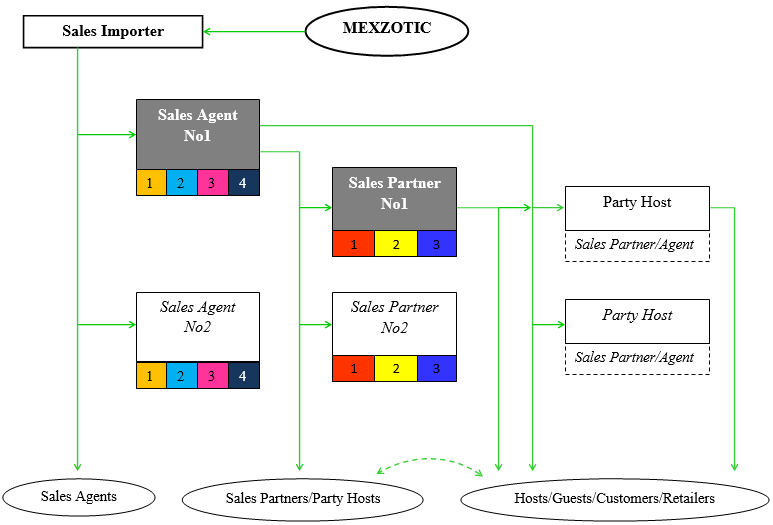 MexZotic has Career Opportunities designed to support and compliment OUR Party Sales Partner and Sales Agent Business. If you like the Party Plan concept we have Business & Career options to choose from. We have an innovative upgrade path for our Party Hosts to become Sales Partner OR Sales Agent. You will enjoy additional Benefits and Discounts the more you sell to your Family and Friends. Sales Partner has the ability to arrange and host own Jewelry Parties, make additional profit from direct sales, manage orders, appoint other Party Hosts & Sales Partner Levels and build a small network of regular Party Guests, Family and Friends to resell and distribute goods. Levels: Three levels to achieve from 25% off to 50% off lowest Jewelry price. Duty: Take Orders, place orders and arrange delivery of Jewelry Products. Sales Agent has the ability to promote, organize and attend Hosted Jewelry Parties, make additional profit from sales, manage orders, appoint other Party Hosts & Sales Partner Levels and build a small network of Party Guests, Family and Friends to resell and distribute goods. The big difference as a Sales Agent is that you will need more time BUT you receive an Over-Ride % profit on all ongoing sales made within your appointed Group on top of the Sales Profit & Rewards you make at each Party. Role: Seek out and Appoint Jewelry Party Hosts, Sales Agents & Sales Partners, Attend Jewelry Parties and support your Group Members. Sales Partner – Level 1: Partner is paid 25% of Total Sales Order Value* and additional ongoing commission of 25% on all future Party Host / Sales Partner Transacted Sales Orders. Example: $300.00 Sales Order Value at Party - Sales Agent Profit $75.00. Upgrade: After $1,500 (approx 5 parties@ $300 each) in transacted sales AND/OR appointment of 3 Partners the Sales Partner- Level 1 would upgrade to Level 2**. Sales Partner – Level 2: Partner is paid up to 35% of Total Sales Order Value* and additional ongoing commission of 35% on all future Party Host / Sales Partner Transacted Sales Orders. Example: $300.00 Sales Order Value at Party - Sales Partner Profit $105.00. Upgrade: After additional $5,000 (approx 15 parties@ $300 each) in transacted sales AND/OR appointment of 5 Partners the Sales Partner- Level 2 would upgrade to Level 3**. Sales Partner – Level 3: Partner is paid 50% of Total Sales Order Value* and additional ongoing commission of 50% on all future Party Host / Sales Partner Transacted Sales Orders. Example: $500.00 Sales Order Value at Party - Sales Partner Profit up to $250.00. Upgrade: After additional $10,000 (approx 4 Jewelry Parties p/w for 8 weeks @ $300 each) in transacted sales AND/OR appointment of 10 Partners the Sales Partner- Level 3 would upgrade to Sales Agent Level 4**. Sales Agent – Levels 1 to 4: Agent is paid 50% of Total Sales Order Value* and additional ongoing commission of 50% on all future Party Host / Sales Partner Transacted Sales Orders AND an additional Over-Ride Commission of up to 25%*** on their Group Sales. Example 1: $750 Sales Order Value at Party - Sales Agent Instant Profit $375.00. Example 2: $1000 Group Sales Order Value - Sales Agent additional Over-Ride Profit maximum $250.00. Example Income: Attend 4 Jewelry Parties per week at $750 average sale per party equals $1500 income per week or $75,000 per year. This excludes any income from Online Sales or the % Over-Ride Commission on additional future sales from your Group Party Hosts or Retail/Sales Partners estimated at an additional $25,000 per year. Note 1: *Above figures maybe applicable to Sales Partner/Agent contributing 3% to 15% of Transacted Sales Orders to subsidize expenses for Host & Guest free/discounted gift products (dependent on Membership Level). Note 2: **MexZotic reserves the right to appoint and/or upgrade any applicable Sales Partner/Agent Level based on experience and/or performance. Note 3: ***Over-ride Commission on Group Sales is only paid at Sales Agent Levels 1- 4.